In 2016, China for just the first time became the biggest trading partner of Germany. China overtook both the United States and France with the U.S. dropping to third place and France remaining in second indicated new data released on Friday. German exports to and imports from China increased in 2016 to over €170 billion equal to $180 billion, showed figures from the Federal Statistics Office. This development is likely welcomed by the government of Germany, which has put a goal of safeguarding global free trade following the threat by U.S. President Donald Trump to place tariffs on all imports. At the same time, his top trade adviser accused Germany of taking advantage of a weak euro to increase exports. Sigmar Gabriel the Vice Chancellor of Germany has suggested that the European Union refocus economic policy towards Asia if Trump continues to pursue his protectionism policies. The BGA trade association in Germany said that given the plans of protectionism by the new White House administration it is only logical that trade ties between China and Germany would become stronger. 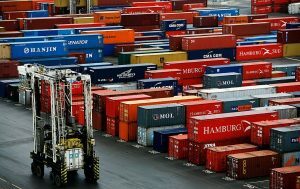 France remained Germany’s second largest business partner with trade volume between exports and imports of €167 billion. The U.S. was third at €165 billion. The U.S. during 2015 became Germany’s biggest trade partner overtaking France after France had been at the top since 1961. The U.S. was helped in 2015 by an upturn in the U.S. economy and a much weaker euro. On Friday, in a separate statement the Committee on Eastern European Relations in Germany said it was expecting exports into Russia would likely increase by a minimum of 5% in 2017. That would be the first increase of its kind in years due to Western sanctions. Looking just at exports, the U.S. was still the largest client for German made products last year, importing goods from the largest economy in Europe worth close to €107 billion. France was the second largest export destination for goods made in Germany with a total amount of imports of €101 billion from Germany. Britain represented the largest bi-lateral trade surplus with Germany. Exports from Germany surpassed its imports from Britain by over €50 billion, showed figures. The U.S. was second with a bi-lateral deficit in trade as German exports into the U.S. surpassed U.S. exports into Germany by over billion. That means Britain and the United States together represented close to 40% of the record trade surplus of Germany that in 2016 totaled €252.8 billion.